Did Theresa May resign with immediate effect from her position of U.K. Prime Minister today? 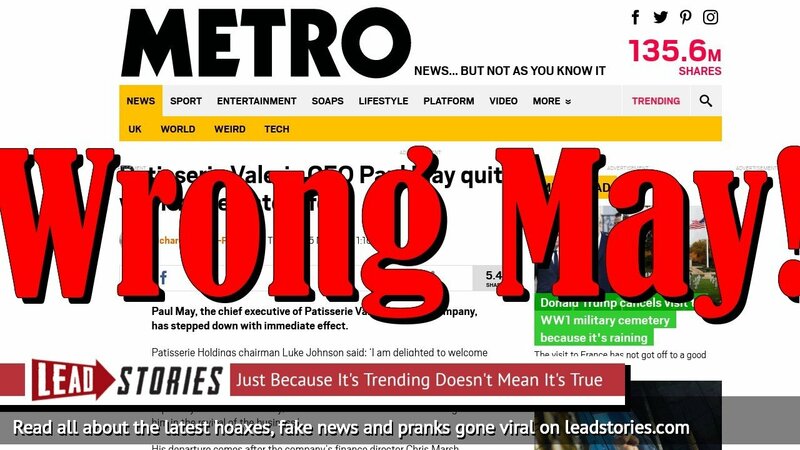 No, that's not true: a story from a British news website about a CEO named Paul May who quit his job was initially published with a misleading headline. The headline was later changed but the original headline kept circulating on social media making the article go massively viral. Paul May, the chief executive of Patisserie Valerie's parent company, has stepped down with immediate effect. Patisserie Holdings chairman Luke Johnson said: 'I am delighted to welcome Steve Francis as new CEO at Patisserie Holdings PLC. 'He has a strong track record of restoring value in turnaround situations, especially in the food industry, and the board looks forward to working with him in the revival of the business.'. The chief executive of troubled café chain Patisserie Valerie has resigned with immediate effect, weeks after shareholders approved a rescue deal for the company. Patisserie Holdings' CEO Paul May resigned on Thursday to be replaced by turnround specialist Stephen Francis, effective immediately. Theresa May is still Prime Minister until further notice.